When you are starting your termination business in Bulgaria, you should familiarize yourself with the tariff plans of local operators in advance. The more favorable the conditions for outgoing calls are, the more money you can earn. 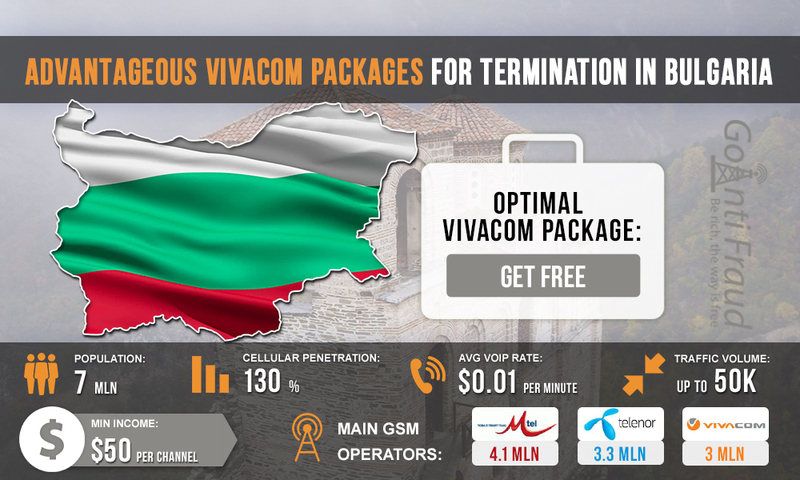 Vivacom is Bulgaria's third mobile operator in terms of market coverage as it has about 3 million customers. The company offers several prepaid packages that can be used for terminating calls. Bravo. The cost is $3.42. The subscriber immediately gets $1.7 for calls, as well as 300 bonus minutes for on-net calls and 300 SMS. Bravo +. The cost is $5.7. The subscriber immediately gets $ 2.85 to the account and 100 bonus minutes for calls around the country. Additionally, when you top up the Bravo card for over $5.7, you get a 300-minute bonus to make on-net calls, or 600 minutes when top up the Bravo card for over $11 and get $ 1.42 deducted. For Bravo + the conditions are similar: topping up the account for $5.7 provides 100 bonus minutes for all networks, and for over $11 - 300 bonus minutes. $3.4 are charged for the service. Viva Standard. The cost is $ 3.4. You immediately get $1.7 to your account. The cost of a minute is $0.25. Get Max. The price of the package is $ 3.4, you immediately get $1.7. The minute of the call costs $ 0.19, plus 100 bonus minutes for on-net calls. When you top up your account for $11, you also receive 100 free minutes. Get Free. The cost of the starting package is $3.4, the subscriber immediately gets $1.7. The minute of a call to Vivacom numbers costs $0.19. When you top up for $28, 1,000 bonus minutes are awarded. OPA! The cost is 4.5 dollars, you immediately get $2.8. One minute of a call to Vivacom numbers costs $0.19. Get Free is the most suitable package for terminating calls. Using it, you can spend about 30 dollars every 3 days, while terminating for 380 minutes. Having provided reliable protection of SIM-cards against blocking by AntiFraud-systems, you can make about $150 from each channel of VoIP equipment. If you install multi-channel gateways and a SIM-bank and manage numerous SIM-cards through a SIM-server, you can increase profits exponentially.